Since Tampa is officially the King of the Cuban Sandwich (after winning a national debate by NPR), we get to celebrate our sandwich every year with the Annual Cuban Sandwich Festival. Last year, over a thousand people showed up to enjoy live cultural musical and dance performances and over 50 Latino food, art, and cultural exhibitors. This year will be no different. 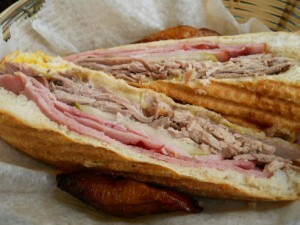 The Cuban Sandwich Festival is also a contest to find the BEST Cuban Sandwich in the Tampa area. Dozens of restaurants will submit samples of their sandwiches in hope of being crowed the Best Cuban Sandwich. Last year, Faedo’s on the Go took the title with Ybor’s own Stone Soup Company coming in a close second. Find out who will be crowed Tampa’s King of the Cuban this year. Dating back to the Cigar City days of Ybor City, the Cuban Sandwich originated in Cuba as something called “mixto,” which was “mas o menos” (more or less) a combination of leftovers stuffed in between slices of bread. The birth of the Cuban Sandwich in America happened in the 1880s in Tampa, Florida, with earlier versions allowing for turkey and tomatoes, the ingredients were later marginalized, to what is used today! A true Cuban Sandwich consists of ham, mojo roast pork, salami, Swiss cheese, pickles and mustard pressed between Cuban bread.